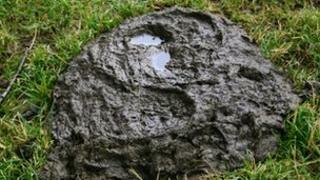 Image caption David Truscott's fetish for rolling in cow manure was described as "bizarre" and "disgusting"
A man with a cow slurry fetish who threatened to kill a farmer who banned him from his land is to undergo a new psychiatric assessment, a judge ruled. David Truscott, 44, was remanded to Langdon Hospital in Dawlish, Devon, in May after admitting threatening to kill the Cornish family on whose farm he rolled naked in animal muck. At Exeter Crown Court, Judge Francis Gilbert issued a new interim hospital order for 12 weeks to assess Truscott. It could be extended, the judge added. As well as making threats to kill, Truscott also admitted threatening to destroy Woodbury House Farm, near Redruth. Truscott had been jailed twice previously, in 2009 and 2011, for breaching a restraining order and rolling in slurry on the farm, the court heard when he was detained. The judge criticised him for his "bizarre fetish and disgusting behaviour". Truscott will be treated in the newly-opened £27m Dewnans Centre at the hospital in Dawlish.